Phenolic Color Thru bathroom stalls Panels offer all the strength and durability of our black core phenolic, with the added advantage of consistent matching color throughout the core, forming a one piece panel which will not delaminate. Excellent choice for high traffic areas. Phenolic Color Thru are durable, water-resistant, and come in a wide range of colors. Perfect for humid environments or anywhere style and durability are important factors. 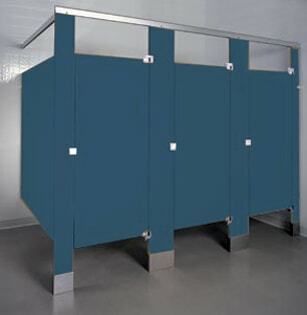 Phenolic Color Thru bathroom stalls is a dyed wood fibrous material that is reinforced with polycarbonate and phenolic resins coated with a non-ghosting, graffiti-resistant surface thermoset and integrally fused into a homogeneous piece. 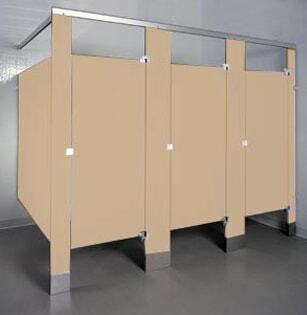 Phenolic Color Thru bathroom partitions has superior durability / repairability consisting of solid color through material that is scratch, dent, moisture and impact resistant and is ideal for heavy traffic restrooms. Composed of dyed organic fiberous material, reinforced with polycarbonate and phenolic resins between clear Melamine surface sheets. Solid color throughout. Resists scratching, gouging dents & impacts. 10 Year Manufacturer’s Warranty. Phenolic Color Thru restroom partitions are the material of choice where durability and strength are required. These partitions are fabricated to stand the test of time. The dense components, combined with stainless steel brackets and fasteners, stand up to the most extreme conditions of moisture and humidity. Phenolic is impact, water, and corrosion resistant, and does not support bacteria. Phenolic Color Thru restroom stalls Panels offer all the strength and durability of our black core phenolic, with the added advantage of consistent matching color throughout the core, forming a one piece panel which will not delaminate. Excellent choice for high traffic areas. 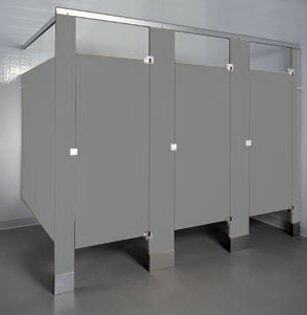 Phenolic Color Thru bathroom stalls carry all the same specs, hardware, and warranties as our standard black core SPC.